This week's One Layer Wednesday challenge is being hosted by Cheryl. The theme is Hallowe'en. I don't send Hallowe'en cards, but I do have a few images I've bought over the years and I've used them from time to time for various Hallowe'en treats or things like that. I've had this A Muse Art Stamps image forever, (before they became A Muse Studios and stopped selling in Canada - have I mentioned how that bugs me?!) but I don't think I've ever used it. I think Hallowe'en is for little kids and it should be fun and cute and not gruesome and scary. (My 13 and 9 year old kids disagree, of course!). Most of my images are cute, but this one's a little spooky. I stamped it with the Recollections sentiment in Versafine Onyx and embossed with clear embossing powder before colouring the eyes yellow. Now who will be the lucky recipient of my first-ever Hallowe'en card? What a cute card Ardyth! Perfect for Halloween! You did it! You made a Halloween card! How'd it feel?! I love it! This is too funny, your card is exactly what the side windows on my front door look like now. I saw a craft where you cut eyes out of black cardstock and back the holes with tissue paper. When it's lit from the back they look so spooky! I really miss being able to get Amuse stamps here in Canada, too. This is such a cute image, and it looks perfect embossed with the spooky yellow eyes! This is a "sweet" Halloween card...the only kind that I will make too! Remember when H'wee was all about fun costumes....wonder why it changed to gruesome & scary? The card looks awesome photographed against the orange backdrop! Oh, you are funny! I'm with you on being okay to just skip cards for this "holiday," but I do have a few and I do like to play in challenges, so I'm glad I have a few. As usual, you've managed to turn your first-ever Helloween card into an artistic masterpiece! I think it's adorably spooktacular!! Ardyth, I so agree with you about A Muse! 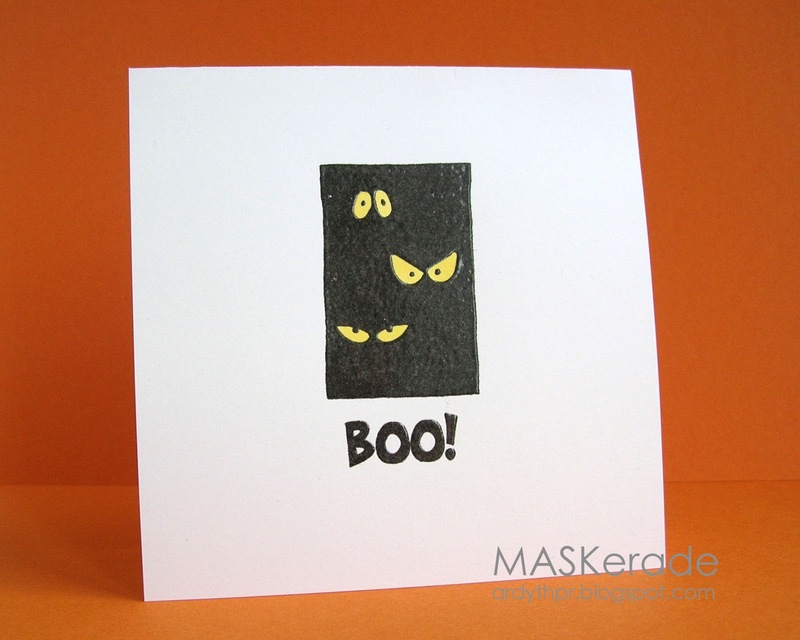 Such a fun and spooky one-layer card. Thanks for playing along.